A man has been found guilty of killing his mother and burying her dismembered body in a shallow grave. The High Court in Edinburgh had been told of a row between James Dunleavy and his 66-year-old mother Philomena shortly before she disappeared. Her remains were later found in a shallow grave in a clearing on Edinburgh's Corstorphine Hill. Dunleavy stood trial for murder but was found guilty of culpable homicide on grounds of diminished responsibility. Judge Lord Jones ordered Dunleavy to remain in the State Hospital at Carstairs while psychiatrists continue to assess his condition. Dunleavy is due to return to court in April for the judge to decide the next move. He had denied battering to death his mother in his flat in Balgreen Road, Edinburgh, sometime between 30 April and 7 May last year. Mrs Dunleavy, from Marino, Dublin, had been visiting her son at the time. He had been working as a labourer on the Edinburgh tram project. The charge stated that Dunleavy inflicted "blunt force trauma" by means unknown, compressed his mother's throat and cut off her head and legs. He was also found guilty on a second charge which stated Dunleavy had attempted to defeat the ends of justice by trying to cover up her death and destroy evidence. Dunleavy had pretended his mother was unwell and had returned to Ireland. Instead, he had put her torso, severed legs and head into a suitcase and took the dismembered body to Corstorphine Hill where he buried her. Prosecutors also said Dunleavy vacuumed and washed his flat to remove blood stains and set fire to a bed and mattress. Det Ch Insp Keith Hardie, who led this investigation, said: "James Dunleavy was involved in causing his mother's death and then failed to report the matter to police, instead opting to conceal her body within a wooded area in Corstorphine Hill. "Following the discovery of Phyllis Dunleavy's body Police Scotland launched a major investigation and appeal for information, which was assisted by a number of specialist agencies. "Thanks to this support a facial reconstruction was created and released to the public and soon after, we had a confirmed identity and a subsequent arrest." 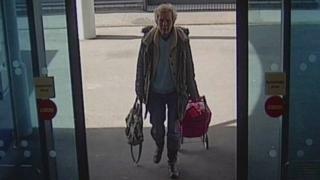 Mrs Dunleavy disappeared days after she arrived in Scotland to visit her son last April. Police launched Operation Sandpiper, appealing for help to identify the body. At first cosmetic dentistry, carried out in Hungary, led them to consider the possibility of a migrant worker from Eastern Europe. Mrs Dunleavy's claddagh ring took the search to Ireland. CT scans of Mrs Dunleavy's skull, combined with computer technology, enabled Dundee University's craniofacial expert Dr Caroline Wilkinson to produce a likeness of the dead woman. The court heard the 66-year-old, who suffered from a number of medical problems and had been badly affected by a stroke, had a habit of wandering without telling anyone where she was going. But by early July her family in Dublin were beginning to wonder where she was. Dunleavy had phoned on 2 May to say she was on her way home, but his mother never arrived. A call was made to police in Edinburgh, followed by a call on 3 July from Dunleavy himself. Police visited him the following day. Four days later he was charged with her murder. Police heard about a shouting match between Dunleavy and his mother about her supposed affair with another man. Witnesses also told the trial that Dunleavy had described "hearing voices" and had told a friend: "I might be evil." Two months after his arrest Dunleavy's legal team arranged for his transfer from prison to the State Hospital. Three psychiatrists told the trial that Dunleavy clearly had a problems - although it was too early to say exactly what. Paranoid schizophrenia was suggested as a possibility. The trial heard that after Mrs Dunleavy's body was found the family refused to help police investigating her death. Mrs Dunleavy's 68-year-old husband, also James, was in court as the eight women and seven man reported their verdict. So too was the accused's brother Austin, 27, who is close to completing a football scholarship, studying history in the US. As they left the High Court in Edinburgh, Mr Dunleavy senior said: "I will not be making any statements."